Have you ever tried adding architecture to your newsletter? Architectural elements such as columns, archways, gables, pedestals and vaults, can be great additions to any publication. We created three samples of newsletters that use architecture for graphical treatments. In the first sample below, we combined renderings of two downtown skyscrapers with actual photos. In the second example below, we used closeups of the structural beams together with a transparent boxes to create a more dramatic eye-catching effect. In the final sample, we used our type treatment as a graphic shape for our our skyline. This is a special effect, whereby, a photo takes on and fills the shape of a type treatment, otherwise known as a mask. 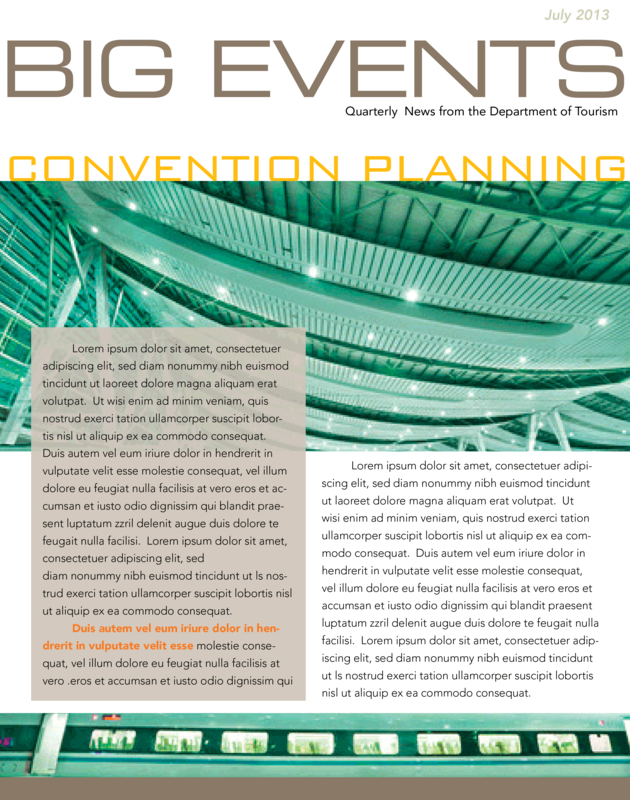 This approach works well for newsletters about architecture, interior design, conventions, tourism, corporate leasing, corporate real estate, travel, city living, construction, and business news. Sleek clean lines and dramatic curves can make for an elegant publication. Your clients will love it. Even if the newsletter does not involve real estate or construction, these angled lines, perspective views and window panes can be screened back as visual enhancements. Indeed these elements can help to promote an image of stability, strength and resiliency and are great graphics to use when creating publications for stockholders. 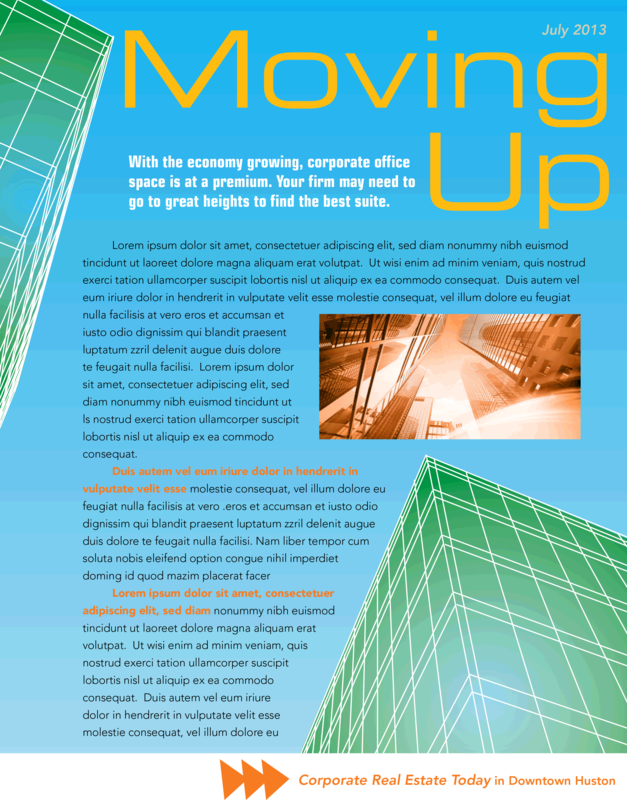 Go ahead build your newsletter with buildings! What a great way to enrich your corporate newsletter. To find out more about how we can help create an effective newsletter, e-publication, or invitation for your firm or organization, contact HWDS at hwdesign@west.net. Creating an effective corporate communication involves lots of creative experimentation to make your publication fresh and inviting. 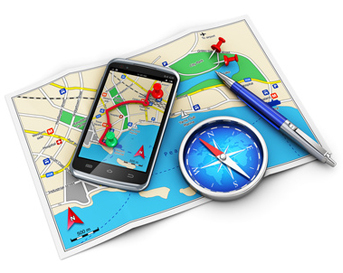 The graphics play an important part in making the publication visually intriguing. Adding special visual effects can make the publication more exciting to read and to follow. We developed a special effect that involves converting portraiture to just a few shades of grey or gradations of one or two colors. It get away from the standard photo treatment and takes your publication one step further into the creative realm. But it needs to be the right audience for a slightly more creative approach. We used close-up portraits, especially of people with lots of character lines or distinctive features. 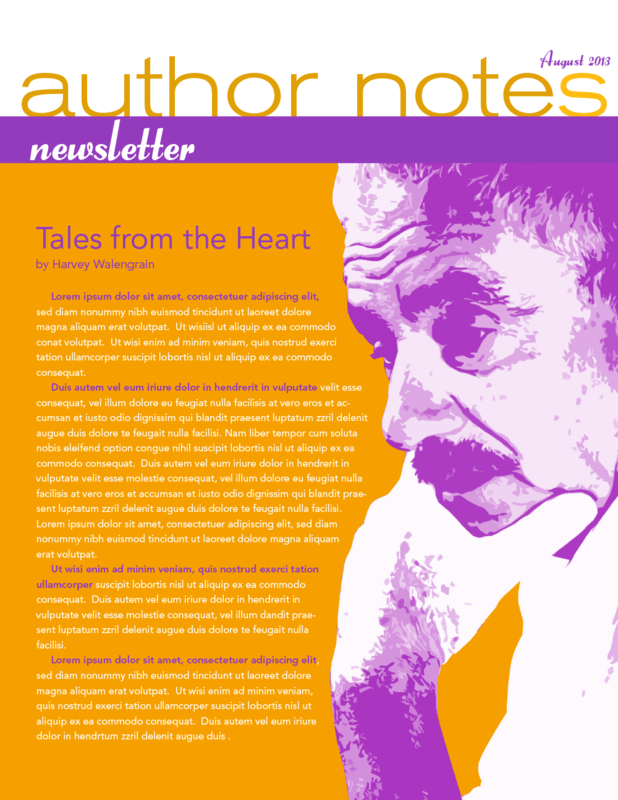 This effect works great for newsletters about people, healthcare, living styles, baby boomers, seniors, authors, artists, and performers, to name a few. It also works great for biographies. 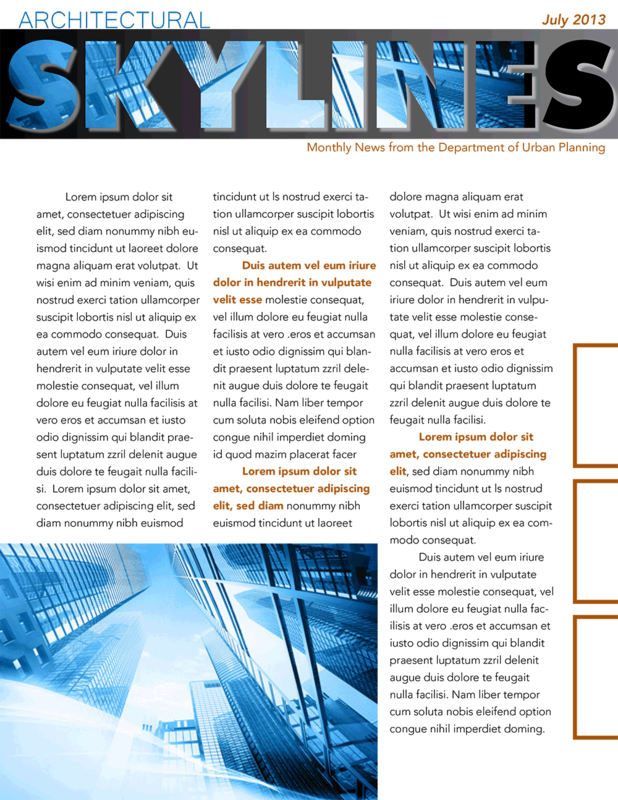 Pictured above and below are some samples of newsletters using this effect. Many of our readers sent us e-mails giving us a thumbs-up on our last blog post, Jumping Off the Edge. As a result, we have decided to create another blog post about unusual border treatments. This time, we used pixels as our special effect. A pixelated border treatment is a great special effect for newsletters on communication, technology, the Web, and electronics. It can also be used for other topics such as automobiles, sports, transportation and corporate communications. Used in the right combination, these graphics can help create successful corporate communications. Take a look at our masthead. It employs a pixel treatment. 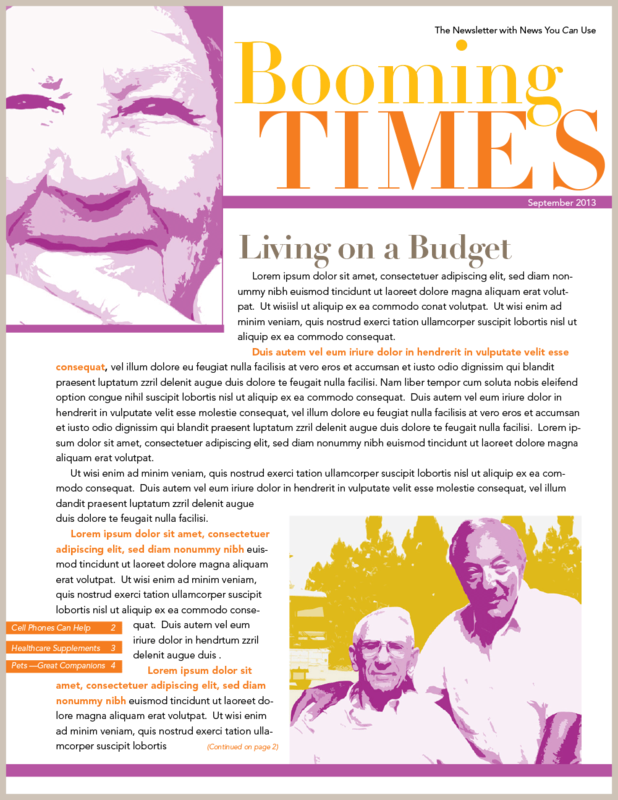 The newsletter below uses a unique pixelated reverse fill. Here’s some examples of different pixelated border effects. To find out more about how we can help create an interesting edge effect for your company’s newsletter, collateral or e-publication, contact HWDS at hwdesign@west.net. After all, we live in a digital world. 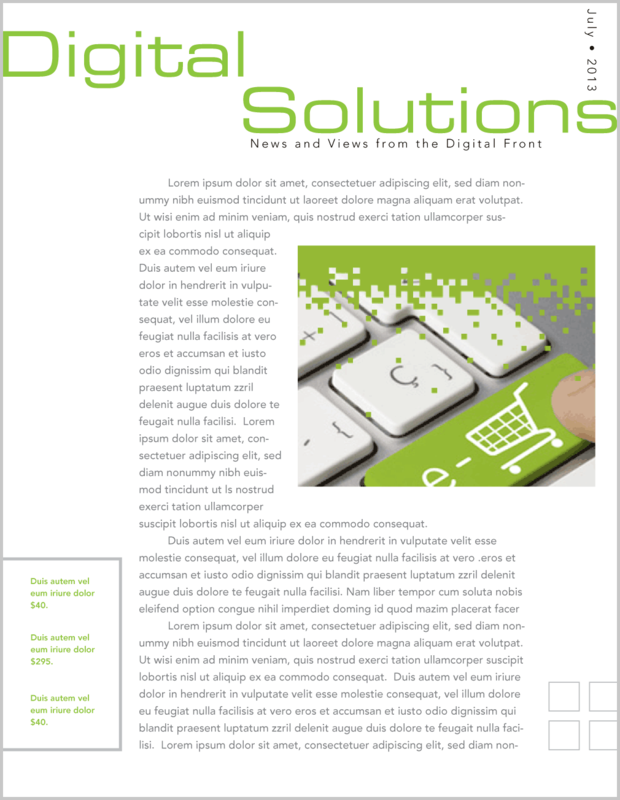 Why not make your newsletter pixel perfect?